It's that time of year again for the Sephora Beauty Insider 15% sale. As we ring in spring, it's a perfect time to update our beauty products and skincare routine with new products that you've been wanting to try. It's also a great time to restock some empties and favourite products. I have been really good at keeping my no-buy makeup policy this year so I don't have a huge list. However, I've compiled a list of beauty products that are worth checking out. This will not be an in-depth review but rather a list and I will include links if I've already reviewed them on my blog. Please note that the products are not listed in any particular order. Shall we begin? Give Me Some Lip is a multi-branded sampler set for creating the perfect lip. 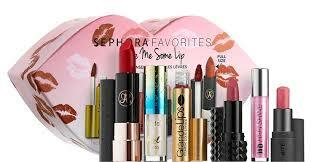 It includes summer's newest lip must-haves with one full size and five deluxe sizes. A liquid lipstick, gloss, lipstick, and a lip balm are all included. Power of the Petal is a nine-piece set of skincare essentials for a day-to-night regimen. It includes must-have skincare products an eye cream to an exfoliating treatment to face masks. I'm tempted to pick up this set for myself because it contains some higher end skincare products that I would like to test out before investing in the full-size product. Soft Glam is Anastasia Beverly Hill's newest warm-toned neutral eye shadow palette. It's an everyday to night palette that includes 14 shades. Seven of the shades are fan favourites, in other words, repeats from previous palettes or permanent single shadows. I would recommend this palette if you don't already own too many neutral shades from the brand. You can read my review and see swatches here. Anastasia Beverly Hills has collaborated once again with Instagram beauty sensation, Amrezy, to create a luxurious limited edition highlighter. The illuminating powder has an ultra-smooth formula and radiant finish. It can be used on the face, eyes and the body. You can read my review and see swatches here. A limited-edition palette featuring six coveted cheek shades in matte, satin, and shimmer finishes. It comes in two different colour options - Cheek Palette I and II. The blushes are formulated with Nar's cult favourite silly and superfine powders. They come in an array of subtle and bold blush shades for a sheer to buildable glow. A 16-hour fade resistant foundation that is lightweight and breathable. The Natural Radiant Longwear Foundation is available in 33 skin-matching shades ranging from deep espresso to the fairest tones. See my review here. Urban Decay has created a go-anywhere, do anything palette inspired by their bestselling Vice Lipstick in the shade Backtalk. The limited edition Backtalk palette includes two palettes in one in a travel-ready case. Backtalk Palette contains 12 beautiful eye and cheek shades in one sleek palette. Reviewed here. Huda Beauty has added new colour options to her Matte Mini Sets. Each set contains four mini Liquid Matte Lipsticks. The sets are available in Au Naturels Nudes Edition, Blushed Nudes Edition and Power Pinks Edition. I'm thinking of picking up the Au Naturels Nudes Edition since I don't have of those shades. Rihanna has created a limited edition gel-based body luminizer to give you that post-vacay glow all year round. It is said to have a dewy high-shine finish. It is available in two shades, Brown Sugar - lustrous bronze and Who Needs Clothes?! - glistening peach-gold. It includes light-diffusing micro-pearls and has a vanilla scent. I so had my eyes on this until I saw the price. I was able to swatch it in store and even though it looked beautiful I will be opting for a cheaper or DIY option. However, I know the die-hard Rihanna and Fenty Fans out there will probably be getting this. The Spring Bonus event begins on April 13th for Rouge members, April 20th for VIB and Beauty Insiders. What's on your list?